Rinse whole lettuce leaves and pat dry, being careful not tear them. Set aside. In a medium skillet over high heat, brown the ground beef in 1 tbsp oil. Drain and set aside to cool. Saute the onion in the ground beef drippings. Add the garlic, soy sauce, hoisin sauce, ginger, vinegar, and chile pepper sauce to the onions and stir. Add in chopped water chestnuts, green onions, sesame oil, and cooked beef; continue cooking until the onions just begin to wilt (about 2 minutes). Pile the meat mixture in the center of the lettuce leaf. 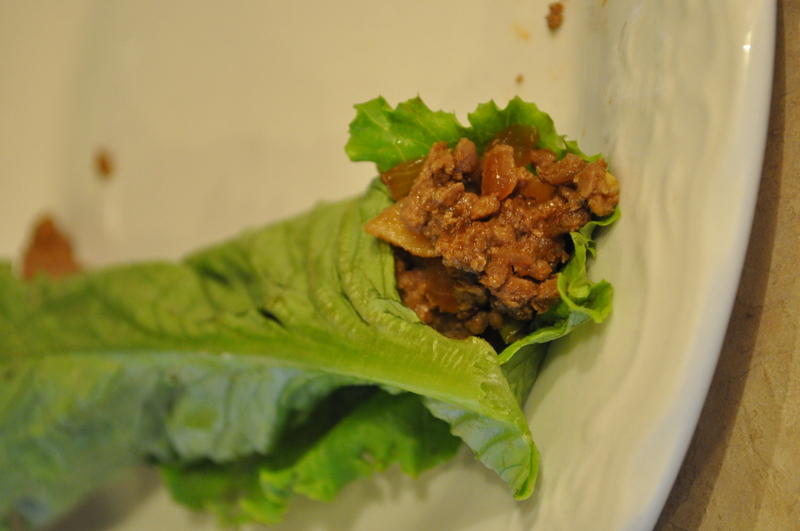 Wrap lettuce around the meat like a burrito. Serve with sweet chili dipping sauce. Serves 6 appetizer-sized servings. Oh these look great and I have some fresh lettuce. I always want to make these and never have.